The simple design of a string trellis should not diminish its usefulness in the garden for supporting plants. With simple tweaks to the supports and types of string, a string trellis can support lightweight plants with tiny tendrils such as fragrant Confederate jasmine (Trachelospermum jasminoides), which grows in U.S. Department of Agriculture plant hardiness zones 8 through 10, or heavy annuals such as indeterminate tomatoes (Solanum lycopersicum). Cut stakes or poles to the desired height for the trellis, plus 18 to 24 inches extra length for burying. The height of the trellis depends on the mature size of the plants you wish to support. Confederate jasmine only grows 3 to 6 feet tall and wide and will happily climb up a small trellis, while indeterminate tomatoes can easily fill in a trellis that is 8 feet tall. Choose poles that are proportionate to the weight of the plants you will grow. Dowel rods 3/4 to 1 inch in diameter are strong enough for lightweight flowering vines such as jasmine, but heavy tomatoes require sturdier supports, such as two-by-two lumber stakes, steel reinforcing bars or galvanized metal fence posts. Drive the stakes into the ground 18 to 24 inches deep at each end of the trellis. Install additional stakes every 10 feet for longer trellises. You can pound most types of stakes or posts into the ground with a mallet or mini sledgehammer, or dig a hole and set them to the proper depth. Taller string trellises require deeper set stakes than small trellises. Hold a level against the sides of the stakes as you set them and adjust as needed to make the stakes plumb. Tie the string to one end post about 6 to 8 inches off the ground. The string you use should be proportionately strong for the weight of the plants it will support. Types of string include butcher's twine, natural twine, nylon string and fishing line. 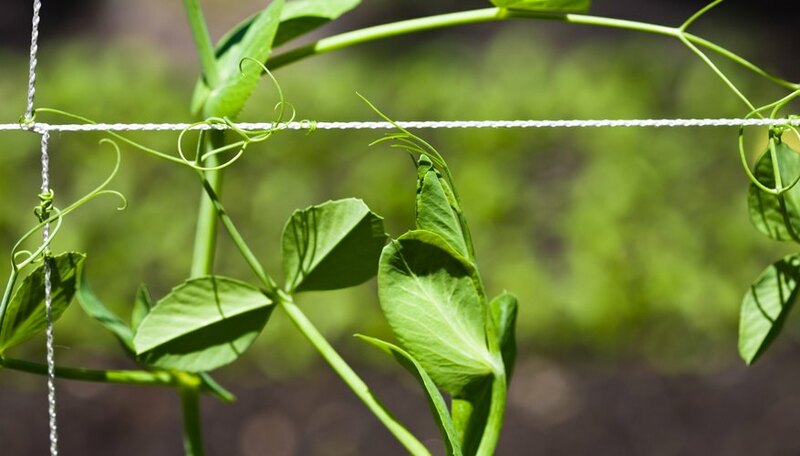 Fishing line is available in different tensile strengths to support any type of plant; the resulting trellis will be nearly invisible. Run the string along the line to the end stake or post. Wrap the string around the end post, run it back in the opposite direction to the starting post, and tie it off. If multiple stakes or posts are needed for a long trellis, weave the string back and forth between the posts as you work your way to the end post. Tie the string as tight as possible without shifting the posts. Tie another string to the stakes about 6 to 8 inches above the first strand. Repeat this process every 6 to 8 inches up to the top of the stakes. Tie vertical strings loosely to the horizontal strings to provide vertical climbing support for plants. Space each vertical strand about 8 inches apart or to the required spacing for the type of plants you choose. This vertical support system isn't always needed, but is beneficial for plants like sweet peas (Lathyrus odoratus), an annual with delicate tendrils and weak stems. Plant your choice of climbing vine plants along the row beneath the first string trellis strand. Follow the spacing needs for the specific plant you choose, usually between 8 and 12 inches apart. Weave the ends of the plants through the strings as they grow. Tomatoes might also benefit from tying the stems to the strings if they appear to need extra support. This basic horizontal string trellis design is easy to convert to a vertical support structure. Screw a horizontal top beam to the tops of the vertical stakes, using the same material for the horizontal beam as you used for the stakes. Tie the string to the horizontal top beam, spacing each strand about 8 inches apart. Secure the bottom end of the strings to a horizontal beam attached to the bottom of the vertical stakes, or drive smaller ring stakes into the ground every 8 inches and tie the strings to the rings. If you have a raised garden bed, screw the stakes to the outside of the raised bed boards to make the stakes even sturdier. Fall cleanup simply requires cutting the strings from the supports and storing the supports over winter.